“Have to” versus, “Get to,” or, The Power of Gratitude in Your Life! Adding gratitude into your life can be powerful. Once she switched the thought in her mind, she also noticed that the attitude spread to the other members of the family. Everyone worked together to get things done, and it kicked off a wonderful experience for the rest of the weekend. 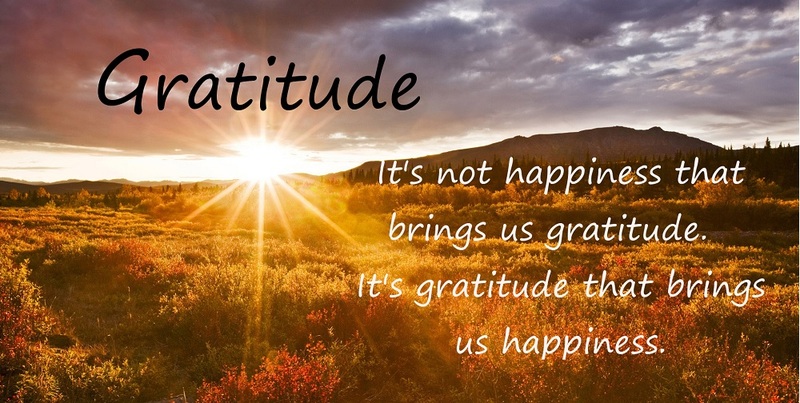 Gratitude has a host of benefits across a wide spectrum, including a stronger immune system, being less bothered by aches and pains, lower blood pressure, better sleep, feeling more alert and alive, experiencing more joy, optimism and happiness, and being more forgiving and outgoing. These benefits can be obtained with just such a shift in thinking. Sometimes if we’re mindful of the moment and think about what is going on, it can cause us to realize that we ARE too busy or stressed to enjoy what is going on. If the list of things for your day is a mile long, even enjoyable activities can start feeling like a “have to”, instead of a “want to,” or even, “get to”. Savor moments of happiness: When something good happens, really enjoy the moment and make it last. Reflecting upon these moments later has also shown to have health benefits. Express it: Simply saying, “Thank you”, benefits both the person who says it and the receiver of the thought. Make it a point for a day to state gratitude for things both small and large. Note how it makes you feel. Keep a gratitude journal: Making notes of what we’re thankful for, either daily or once a week, can be an invigorating experience. This can also help guard against taking things for granted. Meditate on gratitude: I’ve written about the benefits of meditation on a focused mind. There are many ways to meditate, and this includes concentrating on the things for which we are thankful. Later, I realized I had mentioned during a chat with my sister that, “I have to walk the dog now.” Noting that this was something I normally enjoy, I reflected on my conversation with my client. I suddenly realized I had been preoccupied for most of the day. So, I took a deep breath, looked out into the sunshine, and reframed the thought. “I get to walk with my dog on a peaceful evening and enjoy the scenery,” I mused. Due to that simple shift, instead of feeling bothered… I felt happy, smiled, and appreciated the time to head out the door with my pal. Contact [email protected] if you’d like to open up your life to gratitude, and more! Previous post: Have You “Lost That Lovin’ Feeling” for RUNNING?? Here’s How to Get It Back!! Next post: Get Inspired: My Before / After!